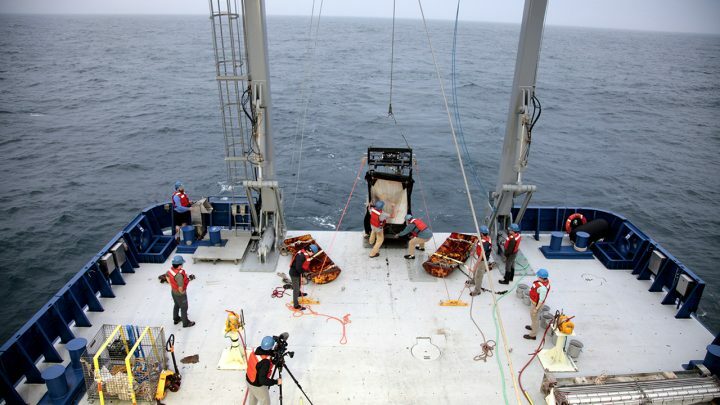 The most significant thing about the trawl is that it marks the first time the R/V Neil Armstrong—or its crew—had put one overboard. Unlike fishing boats (or Fisheries research vessels) the Armstrong is not outfitted with the equipment typically used to launch it. However, with some creative thinking from bosun Pete Liarikos (himself a former scallop fisherman) and the experience of the NMFS scientists on board, the 100 meter-long net and its 825-pound steel doors went over the stern without a hitch. 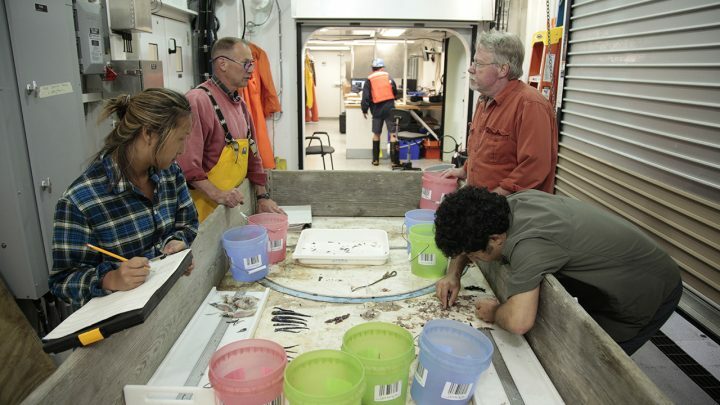 Given that ours is a science verification cruise, the operation demonstrated that a trawl may be used for intensive fisheries research aboard the Armstrong. For the current research objectives, it’s being used to compare the contents of a traditional trawl net with that of the MOCNESS, which has a comparatively small opening. Still, it reeled in a bounty of zooplankton as we made our way across the continental shelf and the deeper waters of the slope. Of all parts of the sea, the continental shelves are perhaps the most directly important to man as a source of material things. The greatest fisheries of the world, with only a few exceptions, are confined to the relatively shallow waters over the continental shelves . . . . Biologically the world of the continental slope, like that of the abyss, is a world of animals—a world of carnivores where each creature preys upon each other . . . . [T]he moving water masses of the ocean currents press against them in their coastwise passage; the pulse of the tide beats against them; they feel the surge of the deep, internal waves. Over the past day, we have crossed beyond the continental shelf to the ocean above Alvin and Atlantis Canyons, undersea gorges that are known hotspots for marine life. Indeed, we noticed plenty of fishing buoys and a few boats on the horizon as we passed through these areas. 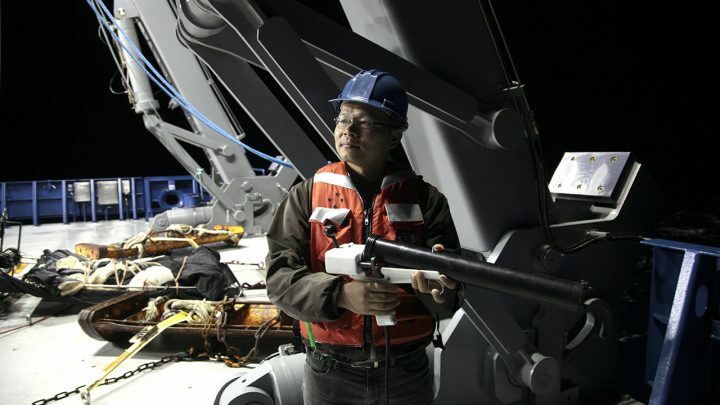 But surprisingly, the echosounder picked up relatively little evidence of marine abundance. After making a horizontal pass across the canyons, the Armstrong headed north along Atlantis Canyon in search of krill by day, then south to the 2200-meter contour, where satellites showed warm (21°C) surface water. These waters promise rich biological treasures, from copepods and larvae to large fish and whales. As we cruised along the continental slope, the spouts of fin whales trumpeted just off the bow—a welcome sight after a day of high seas and fog. After casting the 1-meter MOCNESS during the day and night, the biologists weren’t disappointed with their discoveries. Red salps, balloon-like ctenophores, a variety of amphipod, and a few larval mesopelagic fish kept them busy processing samples into the wee hours. 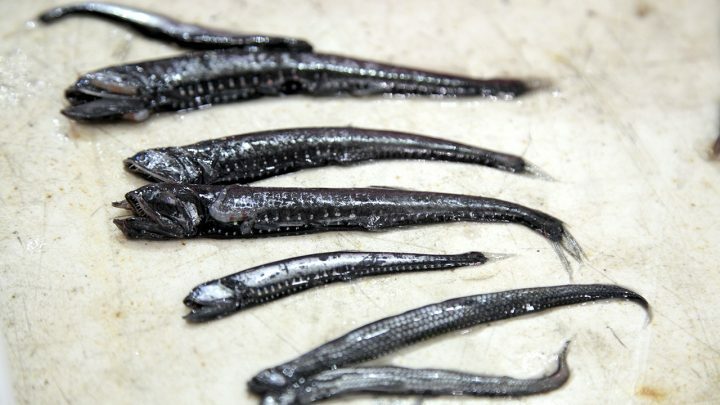 Joel and Christina’s hopes to find larval bluefin tuna were dashed, but they did find bullethead tuna larvae—and a bizarre-looking hagfish. The scientists were surprised, however, by the abundance of pteropods among relatively few krill, one of their main sampling objectives in Atlantis Canyon. The surprises continued overnight as the physical and chemical oceanographers monitored the CTD data and echosounder as we finished the northerly transect of Atlantis Canyon. 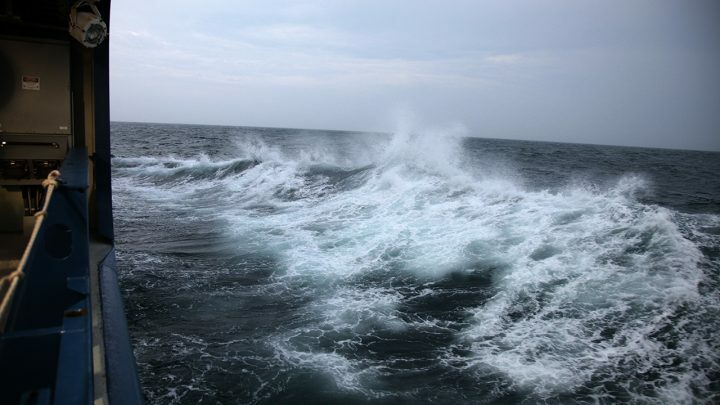 They expected to find evidence of a front, where the warm and cool waters collide to create an upwelling effect that draws in all kinds of marine life. 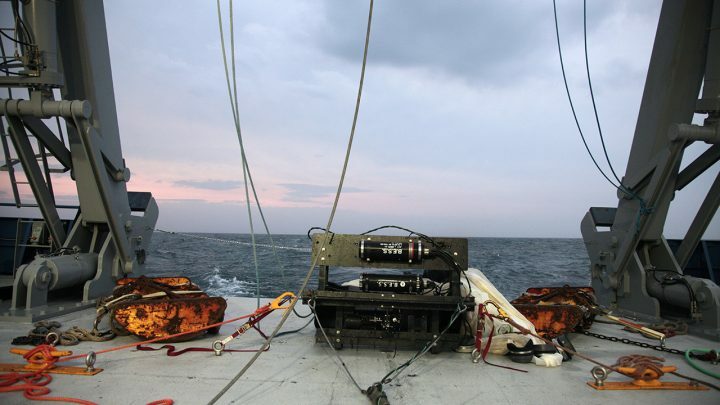 Instead, they found fast-moving water and very little activity on the echosounder. After some discussion they determined this was because of a warm-water eddy that had made its way far inshore. By morning, we were making tracks back onto the shelf in search of the front. On our final day at sea, the researchers are making their final CTD casts and net tows, monitoring the acoustics as they do so. Although we lost the lowest acoustic frequency yesterday, they’re still able to see the smaller creatures and physical features at a range of higher frequencies. Gordon and Andone are especially excited about a Kelvin-Helmholtz billow observed on the echosounder between 20 and 30 meters (66 to 98 feet). Created by internal waves, this underwater turbulence occurs when different densities of water moving at various speeds meet, drawing a variety of zooplankton into the vortex. We’re closing in on the home stretch of this cruise. Before we make landfall on Thursday morning, we’ll complete another 1-meter MOCNESS and mid-water trawl, the echosounder tells us there is action beneath the surface. 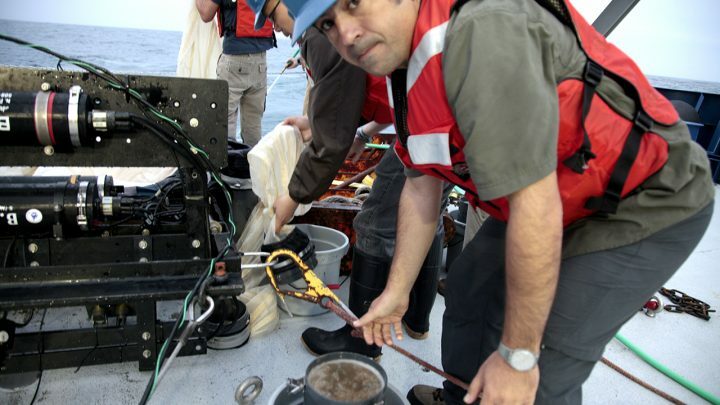 Chief scientist Gareth Lawson has an eye out for evidence of a methane seep in order to obtain its broadband acoustic signature (and the types of marine life around it). If possible, we’ll also do a CTD cast in that area to determine the area’s physical properties. 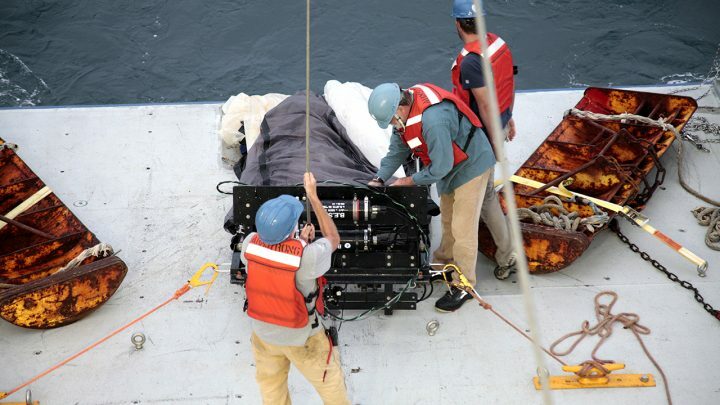 With all the cross-disciplinary research happening around the clock, it’s easy to forget that the real mission of this cruise is to test the Armstrong—not necessarily the ocean. So despite a few technical glitches and equipment mishaps, surprises under the microscope and on the echosounder, it’s safe to say that the ship has passed the test with flying colors.